When it comes to container gardening, pots are paramount. From miniature succulents to exotic palm trees, you need a proper container for your plants to grow. 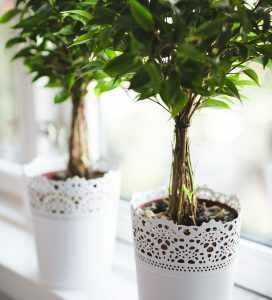 Most indoor plants are sold in standard plastic pots that are functional enough but really don’t do much for visual appeal. 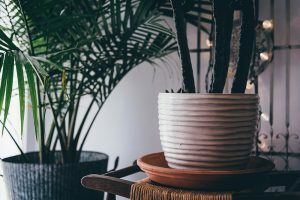 But before you choose the perfect container or stylish plant pot, there are two key considerations to guide you. At the most basic level, the purpose of the pot is to provide the right medium for the plant to grow, and the container you choose should be just the right size. Too small and the plant will soon become root bound. This occurs when the root system takes up the entire pot, giving it no room to expand and preventing further growth. This can also lead the plant getting so out of proportion that it becomes unstable and topples over. If, on the other hand, the plant pot is too big, the compost will stay too moist for too long which will lead to poor plant growth. Pots and planters come in many sizes. Smaller pots are usually sized according to the diameter at the top – a 3 1/2 inch flower pot has an opening that is 3 1/2” wide. Larger containers are sized with a # sign followed by a number with a larger number indicating a larger container size. Drainage is essential for all plants, which is why most flower pots have drainage holes at the bottom. Lack of drainage means the water can’t escape, leading to root rot which will eventually kill the plant. If you’re growing plants indoors, it’s important to protect carpets, hard floors or furniture from accidental water damage. One solution is to place a saucer underneath the flower pot to collect the excess water. If you use decorative planters that have no drainage holes you need be careful so as not to underwater or overwater, since both will be detrimental to plant health. A safe way to get around this problem is to place a traditional plant pot with drainage holes inside a bigger, hole-free decorative container. Indoor planters and containers are available in a near endless variety of styles, sizes and colors, from inexpensive and cheerful to well-made designer statement pieces. If you’re the creative type, you could even make, recycle or repurpose an existing container, widening the choice of planters even further. Whether you go for plastic or terracotta, metal or wood, they all have different characteristics leading to advantages and drawbacks for each. Plastic is the most widely used plant pot material today. It’s inexpensive to produce and durable and comes in an array of colors. It is also lightweight and heats/cools quickly which helps prevent plants being damaged. Best of all, it’s easy to keep clean. What more could you possibly want? On the downside, unless you purchase high quality plastic containers, basic flower pots won’t last more than a few seasons; they will eventually degrade and break. Terracotta or clay is an attractive, sustainable material that’s been used for thousands of years to make plant pots. The pots come in a wide variety of shapes and designs and the largest planters can accommodate ornamental trees. These bottom heavy pots are weighty enough for large plants and suitable for windy sites. 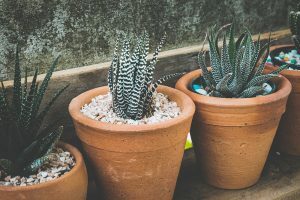 The basic non-glazed pots are porous – they draw moisture from the soil which tends to mean more frequent watering, making them a good choice for cacti or succulents and ferns or orchids. A drawback is these pots also absorb minerals and salts which can cause a white crusty build-up on the exterior. The glazed pots are waterproof and hold moisture better. Clay retains heat for long periods of time and the soil can become quite hot in sunny locations. While this is great for some species, other plants won’t do well in this situation. Terracotta pots can crack and break easily, especially if they are exposed to freezing conditions. For the same reason, take extra care when placing the pots onto a hard surface (tiled floors, concrete balconies) and when re-potting. Metal planters are extremely durable and can be used in a traditional or contemporary style. Most metal will age beautifully in color, or with an aged patina. However, there is little insulation from the elements and metal plant pots can get very hot unless they have a plastic or clay liner. One of the best ways to use a metal container is as a decorative container that holds a less attractive plastic container inside. Depending on the exact material used, plant pots made out of metal can be very heavy – cast iron in particular. For indoor use, consider wheeled planters or a lightweight material such as stainless steel. And although the material is water proof, many metals will rust over time. To guard against this, use aluminium planters that are both lightweight and rust proof. A wooden planter can add a wealth of character to any home. Available in a wide choice of timbers, colors and designs, they are an attractive way to feature houseplants. Most indoor planters come ready painted and pressure treated, so there shouldn’t be much maintenance unless they are used in an outdoor environment like a patio. Untreated wooden planters will soon lose their visual appeal and can be susceptible to insect attack too – not something you want in your home. Wood is a robust natural material that will help insulate plant roots from the sun/heat and cold. However, make sure the container bottom doesn’t get too wet or it can start to rot. To protect indoor flooring, it’s best to lift the wooden planter a few inches off the floor, or use a portable trolley with castors, which is also useful for changing the position of heavy houseplants. Mike James is an independent writer that specializes in houseplants. He wrote this piece in conjunction with Totally Plants Indoor-Plants.co.uk.